Greeting cards have that special touch. They can share your love, memories, or season’s greeting to your family, friends and clients. Make custom greeting cards with us and include your photos, your business logo, and a custom message you would like to share. It’s great, and with quantity discounts, you can share with everyone on your list. 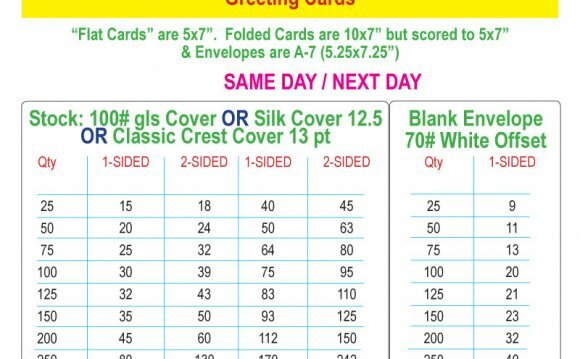 Our custom greeting cards are printed on 80lb cover stock paper, which means that they are the perfect quality, with a genuine feel. Get them printed with full-colour inside and out, and your card will stand out above the rest. Available in two sizes: 4- x 5.5-inch, and 5- x 7-inch. Choose vertical or horizontal layouts for even more customization options. Also includes proper-size white envelope. Prices listed include custom greeting cards size of 4″ x 5.5″ folded size, one (1) customer supplied photo or logo on front cover, one (1) custom message on inside, White 80lb cover stock, choice of Horizontal or Vertical layout, and one (1) proper-size non-printed envelope for every custom greeting card purchased. Completion time is normally within 24 hours from time of design approval. Prices do not apply to custom sizes and different paper stock. Quantity discounts apply only to the same design being printed at chosen quantities. *Prices subject to change without notice. Prices do not include design time. Prices listed include custom greeting cards size of 5″ x 7″ folded size, one (1) customer supplied photo or logo on front cover, one (1) custom message on inside, White 80lb cover stock, choice of Horizontal or Vertical layout, and one (1) proper-size non-printed envelope for every custom greeting card purchased. Theodore "Ted" W. Drake (September 2, 1907 – May 25, 2000) was an American cartoonist, graphic artist, and sports artist known for creating the college-sports mascot the Notre Dame Leprechaun.